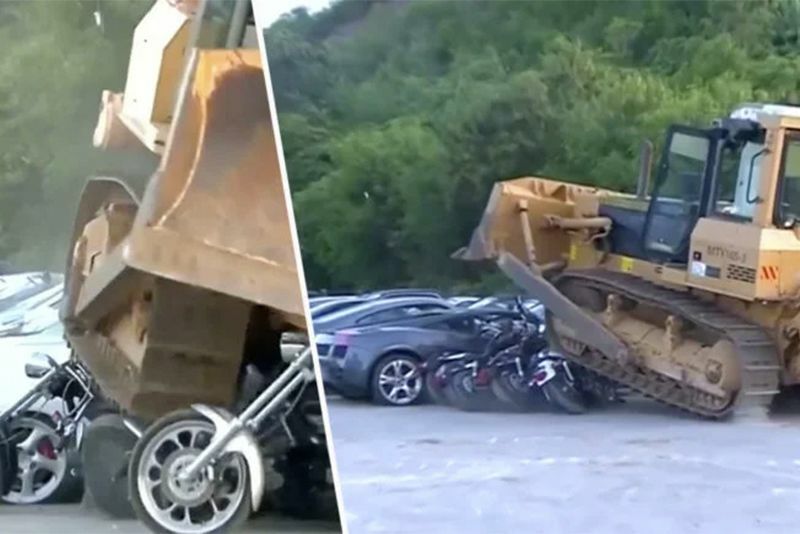 Rodrigo Duterte, president of the Philippines, recently gave the order to destroy 68 supercars and eight motorcycles that customs had seized after being illegally smuggled into the country. It's crazy to imagine that anyone would want to destroy millions of dollars worth of supercars considering how many of us dream of having the luxury of owning just one. Although, there are likely plenty who would relish in the idea – those who chase down whaling ships, for instance. And let's be honest here, the order wasn't to 'destroy the Nürburgring lap time', it was to literally crush them with a bulldozer. That's right, Duterte chose a bulldozer as his modus operandi to crackdown on smuggling and corruption in the country. Wearing a hard hat and a sparkling white shirt, Duterte had a few words for everyone before the massacre of metal got underway, admitting that, although he knew he would not be able to eradicate the problem fully, destroying the contraband was an important part of his plan. He said: "I did this because you have to show to the world that you have a viable place of investment and business. And the only way to show it is that you are productive and that you have the economy, to absorb the productivity of the population," adding that, "establishing law and order" across the country was the first part of his plan. According to a statement from the president’s office, the vehicles destroyed on July 30, 2018, were just a portion of around 800 cars and bikes seized by port authorities in Cagayan including Lamborghinis, Mustangs and Porsches, reportedly worth a total of 298 million pesos (£4.26 million). As the president cheered as he watched the destruction of the luxury vehicles in the Philippines city of Sta Ana, Cagayan, it's worth noting that this wasn't the first time Duterte has obliterated contraband vehicles. In February this year, Duterte ordered the demolition of dozens of luxury cars worth £2.11 million that the Philippines Bureau of Customs had seized, including a Corvette Stingray, thought to be worth around £850,000 alone. In the past, seized vehicles were impounded and auctioned off, with the government taking the proceeds. Duterte, however, would prefer to make it clear that his government will not profit from crime and rather get rid of the vehicles completely instead. And he has the backing of the Philippines police who have vowed to intensify the fight against crime and drugs. Speaking to the media, police chief, Oscar Albayalde, said: "Surgical and chilling will be the trademark of the reinvigorated anti-illegal drugs and anti-criminality campaign". Albayalde also said that there would be ‘frightful’ consequences for anyone continuing to sell drugs, adding that there is a renewed focus and intensity on the crackdown on drugs in the country.